Venezuela 70 Volume 2: Cosmic Visions Of A Latin American Earth: Venezuelan Experimental Rock In The 1970s and Beyond. During the seventies, Venezuela was one of the most prosperous countries in South America after oil was discovered in the North West of the country in 1914. Soon, there was the equivalent of gold rush in the Maracaibo basin. However, it was liquid gold prospectors came in search of, oil. Before long, most of the biggest oil companies were beating a path to the Maracaibo basin and were soon shooting fish in a barrel. There was oil, and plenty of it. As a result, people came from all over the world in search of work and wealth. This was no surprise, as Venezuela was ideally situated. That had been the case for over 200 years. People had emigrated fro Germany, Italy and Portugal, and so had Arabs and Africans. Venezuela had always been a multicultural country, and it was no different in 1928. By 1928, Venezuela was the largest exporter of oil in the world and had become home to many of the world’s biggest oil companies. They came in search of black gold, and found a plentiful supply. This they exported to across the globe. However, by 1943 the Venezuelan government were tired of watching their oil heading out of the country, and decided to take action. In 1943, the Venezuelan government passed laws that resulted in a 50/50 split in profits between the government and the oil companies. This was a huge blow to oil companies, but the Venezuelan government were resolute. They weren’t going to change their mind. Especially when the money raised from the oil tax transformed Venezuela into one of the most prosperous countries in the world. That was the case through the remainder of the forties and fifties. By 1960, Venezuela’s new, democratically elected government played a leading role in founding OPEC, whose aim was to ‘support’ the price of oil. Things were changing in Venezuela. The country continued to prosper in more ways than one during the sixties. By then, Venezuela had a rich cultural capital. The kinetic arts scene was thriving, and so was music. Traditional forms of Venezuelan music continued to prosper in some parts of Venezuela. However, many Venezuelans began to look outside of the country for musical inspiration. They looked to Cuba, Puerto Rico and Latin America. Some Venezuelans had travelled to New York, and heard the Nu Yorican which was popular within the Latino community. This music soon began to influence Venezuelans. So too did British rock music. However, other types of music from within Venezuela began to influence the music scene. With so many immigrants settling in Venezuela, they brought with them their own musical influences. These different genres all played an important part in Venezuela’s musical future. Meanwhile, the prosperity continued, and there was an air of positivity during the sixties. Venezuela was a very different country and was now run by democratically elected government, who looked like they were about to play an important part on the world stage, given their role in OPEC. However, as the sixties gave way to the seventies, Venezuela changed, and the wider world were in for a surprise. In 1973, Venezuelans voted to nationalize the oil industry. For all the companies who had invested heavily in Venezuela, this was a massive blow. The only small crumb of comfort was that the new law didn’t take force until the 1st of January 1976. After that, Petróleos de Venezuela would take over exploration, production, refining and exporting oil. This meant all the money made out of oil, stayed in Venezuela, and made the country even more prosperous. That was the theory. The only problem was, that by the seventies corruption was rife within Venezuela. Still the country continued to prosper, pre and post the ‘1st’ of January 1976 and Venezuela remained a wealthy and prosperous country financially and culturally. Part of Venezuela’s rich cultural capital during the seventies was its music scene. Venezuelan musicians were creating ambitious and innovative music. However, that music has never been heard outside of Venezuela, which is a great shame, given the quality of music produced by Venezuelan musicians during the seventies. However, Soul Jazz Records have just released Venezuela 70 Volume 2: Cosmic Visions Of A Latin American Earth: Venezuelan Experimental Rock In The 1970s and Beyond which is another selection of groundbreaking music. That music was made by pioneering musicians whose raison d’être to create album of groundbreaking and innovative music. Most of these artists and bands were part of the Venezuelan underground music scene and were relative unknowns. 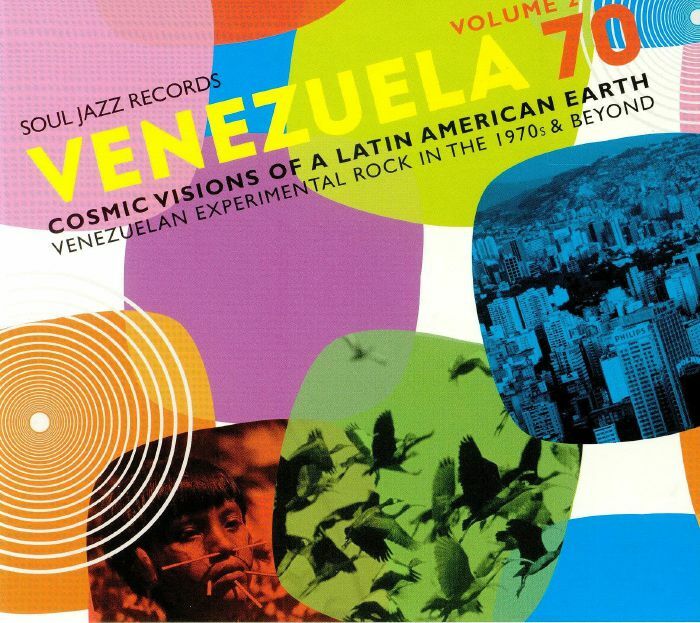 Sadly, that remains the case even today, and it’s only the release of compilations like Venezuela 70 Volume 2: Cosmic Visions Of A Latin American Earth: Venezuelan Experimental Rock In The 1970s and Beyond that may introduce these artists and bands to the wider audience that their music so richly deserves. Back then, artists and bands fused elements of disparate and sometimes unlikely musical genres with everything from progressive rock and jazz, electronica, experimental music and even disco during the seventies. This was very different from much of the music that was popular in Latin America during the seventies. This included salsa which filled dancefloors across Latin America. Meanwhile, many Venezuelan rock bands were heavily influenced by British and American bands. However, this changed in the seventies when there was a revolution in Venezuelan music. Suddenly, a new generation of Venezuelan artists and bands began releasing groundbreaking music from the seventies onwards. Eighteen of these artists feature on Venezuela 70 Volume 2: Cosmic Visions Of A Latin American Earth: Venezuelan Experimental Rock In The 1970s and Beyond. This includes Vytas Brenner who contributes the folk rock of Agua Clara. He returns later with La Sabana and Tragavenado which are a reminder of a truly talented singer and songwriter. Straight away, Daniel Grau’s cosmic disco experiment Dejando Volar El Pensamiento which in parts brings to mind Giorgio Moroder who has obviously been an influence, Daniel Grau’s other contributions include Delirio En Fa Menor and Voy which are both a remainder of a pioneering musicians. The driving disco-tinged funk of Orchestra Julian ’s Do It With Class is a real hidden gem. So is the psychedelic rock of Vytas Brenner’s Gavilan with its blistering guitar licks and funky backdrop. Vytas Brenner also contributes Mandingo, La Sabana and Morrocoy which are a reminder of one of one of Venezuelan music’s pioneers who sadly, is one of the country’s best kept musical secrets. Machu Picchu Dos (El Nino Anciano) is best described as a slice of tropical funk from Un Dos Tres Y Fuera. They only feature once and so does Johnny Lamas whose Noches En Caracas is one of the compilation’s finest moments. Closing Venezuela 70 Volume 2: Cosmic Visions Of A Latin American Earth: Venezuelan Experimental Rock In The 1970s and Beyond is Aldemaro Romero Y Su Onda Nuevo’s joyous sounding Una Por Una with its feel-good sound. The various artists and bands on Venezuela 70 Volume 2: Cosmic Visions Of A Latin American Earth: Venezuelan Experimental Rock In The 1970s and Beyond were all pioneers determined to push musical boundaries to their limits as they created groundbreaking and innovative music. To do that, the artists and bands fused elements of electronica, funk, jazz, and Latin rhythms with progressive rock, psychedelia and rock. Some added Venezuelan roots music to the mix which created a new and unique sound which combined elements of the music of the past and present. This music was all part of a new musical era which is celebrated on Venezuela 70 Volume 2: Cosmic Visions Of A Latin American Earth: Venezuelan Experimental Rock In The 1970s and Beyond and is a further reminder of the groundbreaking and innovative music being released in Venezuela during what was a golden age for underground music. ← THE LIBRARY MUSIC FILM: MUSIC FROM AND INSPIRED BY THE FILM.